"Despite a 42degree day and 98% humidity I was determined to visit the Thien Mu Pagoda (sometimes called the Linh Mu Pagoda). The seven tiers of the Pagoda represent the seven steps to Enlightenment. The Pagoda, dated from 1601, is about 5 Kms outside of Hue City and I would say is a ‘must see’ if you visit here. It is a very scenic bike ride along the road that runs south-east beside the Perfume River. If you don’t want to cycle you can get a boat from Hue City to the Pagoda which would also be a very pleasant trip. The bike ride passes lots of interesting sights." The Thien Mu Pagode - is located on a hill, just 5 kilometres from the city of Hue. It's situated on the northern bank of the Perfume River. 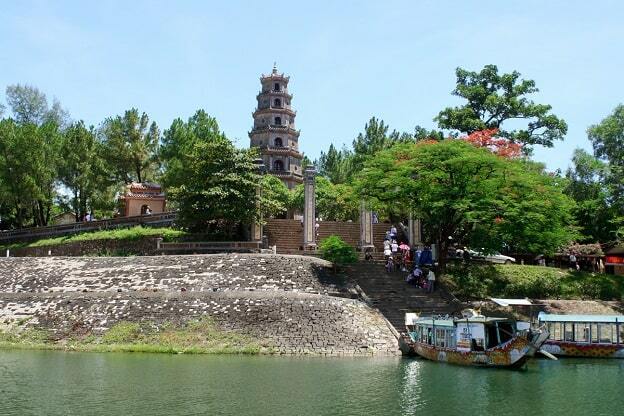 The pagoda was built in 1601 and ordered by Nguyen Hoang, who was at that time the ruler of Thuan Hoa (now Hue). In the following ages, the pagoda was renovated and upgraded several times. The tower has seven floors and is 21 meters high. It is one of the tallest pagodas in Vietnam. The landscape around the pagoda gives the visitors a peaceful and relaxing feeling. Thanks to a garden full of flowers and green grass. With a location on the Perfume river and pine forest behind the pagoda, makes this place romantic to stay here. Another useful tip for those who like to go cycling to the pagoda: departure in the early morning or late afternoon is a very good option because of the heat, which can dominate in Hue. According to legend, the local people saw a woman in a red shirt and green pants on the hill along the Perfume River. She told the people that one day a ruler would come, who had great power and would be important for the entire region. He would build a Buddhist temple here. Then the woman disappeared and never returned. Since then the hill is called Thien Mu Son (Mountain of Heavenly Lady). In 1601 the ruler and governor Nguyen Hoang at that time heard the legend. He decided to build the pagoda and named it Thien Mu Tu (Thien Mu Pagoda). Until now, the pagoda is still known under that name, although it's also known by another name: Linh Mu Pagoda. The octagonal Phuoc Duyen Tower (1864) is the famous tower of Thien Mu Pagoda with a symbolic link. It's 21 meters high, is located in front of the pagoda and is visible from the Huong River (Perfume River). On each of the seven floors there is a statue of Buddha. Inside the tower a spiral staircase leads to the upper floor, where once stood a golden Buddha statue. Nguyen Huang Temple is in front of the tower. The main temple is the Dai Hung, which is a beautiful architecture. Near the entrance are 12 huge wooden sculptures of terrifying temple guards, with real facial hair. There is a large clock (2.5 m high, 3,285kg) from 1710 and a marble tortoise (2.58 m) from 1715 are located in the main building. There is also a large bronze plaque, which was given to Thien Mu pagoda in the year 1677 by a mandarin of the province of Quang Tri. A complex of monastic buildings is in the middle. Here monks perform their daily routines, such as cooking, stacking wood and weeding. Beginners can also be seen practicing their calligraphy. The pagoda is surrounded by a garden of beautiful flowers and plants, which are carefully maintained. There is also a bonsai, which is adjacent to the Austin of Buddhist monk Thich Quang Duc. Thich Quang Duc drove in his Austin to Saigon to protest against the Diem regime. This regime was supported by the Americans. On a busy street in Saigon, he set himself on fire in protest against the discrimination of Buddhist monks (1963). 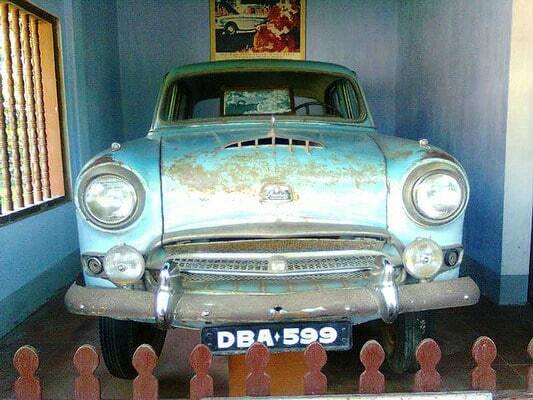 This car is now in a building at the Thien Mu Pagoda and is visited every day by monks. 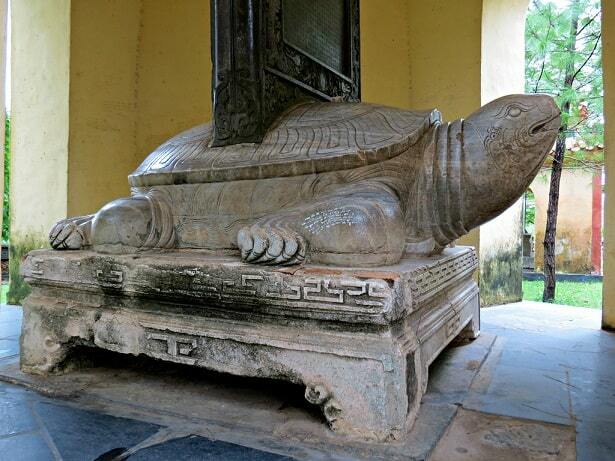 Remarkably, the Thien Mu Pagoda owns a little number of Buddha's statues, in contrast to the other pagodas in Hue. Actually the site of the pagoda looks more like the grounds of the rulers, the mandarins in ancient Hue. The visitors immerse themselves here at a special place, where it is very different than the hustle and bustle of life in Hue. If you come through the entrance of the pagoda, you feel at home; that you have left all your worries and fears behind you.